As is true many past times, our vacation starts with a long 3 hour wait in the airport, a painfully boring flight (7 hours this time) to Frankfurt, followed immediately by a miniature fiasco at the car rental upon landing, and, finally, getting hopelessly lost on the way to our first destination – and that’s WITH a GPS! As marvelous as today’s GPS is I would advise that you keep a map handy. The GPS is modern technology at its best but it is not magic nor is it infallible. You do realize it’s the old adage “Garbage In Garbage Out.” It was explained to us on a subsequent trip to Tuscany by a very reputable guide that he had escorted a passenger whose job it was to map the area for a GPS. In so doing there was a lot of free reign exercised when it came to areas where it was debatable which way was the correct way to go. At one point said passenger could not make a decision so “went with their gut” and documented the directions accordingly. I guess that’s how it is possible to hear the following from your GPS, “When it is safe to do so, make a u-turn.” Immediately after completing the maneuver you hear once again, “When it is safe to do so, make a u-turn.” Now I’m no genius but if you follow these instructions you are right back where you started and if you continue to obey you will forever travel in a circle – well, a square. The GPS did get us to Amsterdam’s neighbouring Haarlem with ease. Sadly it ended there, as we spent 2 hours in Haarlem, literally driving in circles, looking for our B&B. 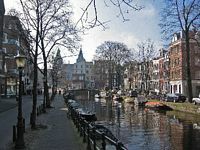 Haarlem is a neighbouring town about 20 minutes from Amsterdam. The town is quite lovely in its Amsterdam wannabe way. We are used to the North American road system which characteristically is arranged in a familiar grid pattern. Much of Europe favours a circular motif consisting of numerous roundabouts intersected by several roads radiating off in all directions like the spokes of a wheel. The markings of some city and rural streets are often not like anything we are accustomed to in North America. There is very little evidence of traditional signage on posts at intersections. If marked at all a street name may be on the side of a building. And not on a plainly visible sign either. It may be painted on the brickwork and it may be a hundred years old. Even worse, that street name you are so desperately seeking may be painted on a curb or on the street itself – right under the car you are now sitting in cursing the situation. It is oft times an exercise in futility searching for these markings and likely a true test of your travel worn patience trying to decipher them if you can find them at all. Likewise, highways are not always marked in the fashion to which you are accustomed. The useful words, north, south, east and west are often neglected. In their place a destination is given. That is fine if it says Rome or Paris or something that you are familiar with. However, nothing strikes despair into your heart faster than seeing a highway marker indicating left to Waalwijk and right to Oss. We are still in the Netherlands right? We are, we just don’t know where. We realized early that the GPS was not performing well. We shortly learned that, like a computer, this GPS requires a DVD disc to operate. It is equipped with a DVD from its country of origin, Germany. Therefore, it works wonderfully in Germany. Like a map, there is a small area of overlap into bordering countries. Just enough to fool you into thinking it still works. We have now entered Switzerland and are far enough into it to know that the GPS will not work. Annoyingly, it TRIES to work, but gives false information, so we hit the point where it does more harm than good. What are we going to do now? Come on, surely you are not so entrenched in this electronic, technical world. No, not yet! 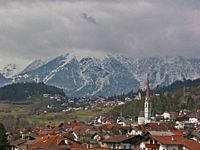 We turned the GPS off, bought a map, got off the highway onto the secondary roads and got a good look at Switzerland. 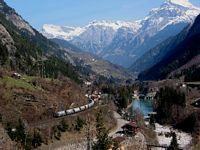 You leave Switzerland through a canyon and enter an incredibly charming part of Italy scattered with little villages with narrow streets. Roundabouts rule. I think I spent half the day in them. We fell way short of our destination of Cortina. We’re in a nice hotel in Aprica. We had to take whatever was open; most places are closed for the season. Aprica is an Italian mountain ski town, so I’m not quite sure why things are closed for the season. It seems to me, this IS the season, after all it is winter. Nobody speaks English. Karen has apparently gotten along admirably by speaking French with them. Arriving in Venice the following day we were expecting a nightmare finding the Tronchetto, the Vaporetto and the hotel. We got good directions (in French) to the Tronchetto. The rest was frighteningly easy, so very rare for us. On the way back to Frankfurt the drive through the Dolomiti was quite wonderful. This is a place in Northern Italy that I have always wanted to see. It took this long to arrange a trip that could include it. Snow covered craggy peaks, blue skies and wonderful Italian mountain villages. The roads are confusing as can be. Tell me how can you get lost on a road that goes into town then comes out about 3 miles later? Lots of turn backs, asking directions in whatever language seemed to work, and cursing – yeah, lots of cursing. The trip from Villach, Austria to Vienna was uneventful until we got to Vienna and got hopelessly lost again. We decided to give the GPS another try but it doesn’t seem to know where it is either. After Karen persistently asking numerous times, we found the hotel. I couldn’t tell you where it is; somewhere near the big ferris wheel, but then looking for that nearly put us in Hungary; but it is a quaint, beautiful hotel. Time to catch up on e-mails and try to figure out where we are. In the major frustration category; because you cannot park on the street overnight on weekdays, the hotel has selected a public parking lot in the “nearby” fair grounds. I guess it really wasn’t that far, but in a city where we have no idea even which direction we are going it is very difficult; and try finding your way back to the hotel! Thank goodness Karen is so adept at asking directions, or we’d never get anywhere. We wanted to take a segway tour of Vienna but they have not started the tours yet, so we’re on our own. This is not easy when you have no idea where you are, where you want to be, or what you are looking at. This is not the best way to see an incredible city like Vienna. We did start at St. Stephens Cathedral, as we noticed last night when we got off the subway there, that it appeared to be a fairly significant spot. Armed with only a map, we found the Royal Palace area which seems to be the old city centre. 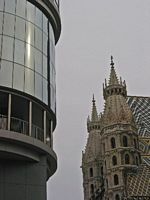 Many of Vienna’s historic buildings are in this area. Of course, we did have to ask directions to get there. Last thing on the agenda is to move the car to the street in front of the hotel for a quick getaway tomorrow. The car was easy to find; the hotel, no such luck. I think we stopped 4 times to ask for directions. We’re talking about a mile away here! And we’ve already done it twice before!!! We left very early (6:30 AM) as we anticipated hell on earth getting out of Vienna. Ironically, it was easier than finding our hotel from the parking lot. We had Mapquest directions (which got us started), the GPS (which pointed us in the right direction) and only one stop to ask directions (which, for once, were bang on). Can it bes this just become so routine that we’re getting better at it now. On one of our many “where in the hell are we?” excursions, we stumbled across an absolute gem of a hotel in Frankfurt. I would love to come back here for a few days. I pretty much guarantee I would not be able to find it again though. Just so we would not finish the trip with too much confidence, we got hopelessly lost trying to return the car. We actually ended up back at the hotel we just left to ask directions for the second time. The manager there, who speaks incredibly good English, gave us great directions and we were able to get the car back (with one final stop to get the last 2 streets identified) by around 10:30 AM. All this because the GPS originally led us to a totally different area with the same street name but in a different region, borough, or whatever. Our flight is at 1:15 PM so we don’t have a long time to wait. Whoo-hoo! I guess we got to the airport (we were on a shuttle, which is the only reason we didn’t get lost again) just after 11 AM. By the time we checked our luggage, checked in, went through security, and lined up for final documentation in the boarding area, it was time to board. That’s the best part of cutting it really close. So, you see, getting lost has its advantages and it certainly puts a laughable spin on a fabulous 5000 kilometer road trip.